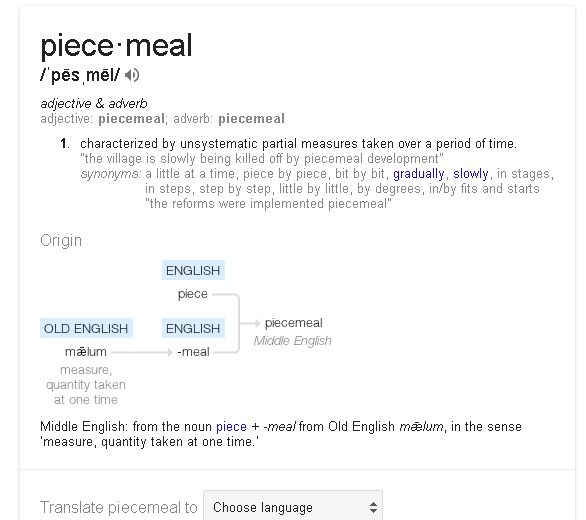 When I was growing up in the 1950's, my mother used "piece" as a verb, meaning to snack on something outside of mealtime. She might say "Do you want to piece on something?" while offering me a cookie. Or she would tell me not to piece too close to dinnertime. I have never heard anyone else say it excepet members of her family. She was born in southeast Kansas in 1926 to people of German and British descent. I suspect that the British side of your family was from Scotland where a "Piece" was, and still is, a snack (to be more precise, a Sandwich - usually a Jeely [jelly] Piece). Scottish school children still take a "Play Piece" for the morning recess break, this can be anything from fruit to biscuits (cookies), crisps (chips) or even a Jam Sandwich. However, piece is a noun, it may be that, across the pond, over the years the action of having a "Piece" evolved into a verb. There are loads of examples of common English words that are used VERY differently in Scotland. To row usually means to argue, but in Scotland you can give someone a row (tell them off) or request, usually from a younger person to an older person, that the older person "Give (another younger individual) a row" for some transgression. In the West of Scotland one can even "Give someone INTO a row". In most parts of the world Messages are delivered, in Scotland people "go FOR the messages" - do a shopping! My grandmother also always used piece in this way, as a verb: "Were you piecing on the cake? ", or "I feel a little hungry; I could piece on some leftovers." Her maiden name was Tandy and she had Scotch and Irish ancestors, but both sides of her family had been in the US a very long time (one ancestor on the Mayflower, DAR eligible on both sides) — she was born in Oregon in 1920. She also still used "et" and "het." I have only used in the context of piecing together a puzzle. Although it may take its roots from piecemeal the adverb. This is the first link I've found in reference to the phrase "to piece on." I was surprised to find that none of the online dictionaries refer to this term. I heard both of my parents use this phrase when I was growing up, (beginning in the mid-1950s) and, indeed, all their lives. My father still "pieced on nuts" right up until his death at age 93 this year. Both sides of my family are entirely of Italian descent, so any German or Scottish etymological origins would have been passed on by way of locality, not through family/cultural usage. My mother was born and raised in Ohio, and my father lived in Illinois during his youth and college years. (Their parents all immigrated from Italy.) It may be a Midwestern phrase, and appears to have existed prior to the 1950s - at least in Ohio. My father received a letter from the dean of Ohio University in 1946 in which the dean remarked, "How could I forget a man who pieced on two dozen donuts?" Thanks for the posts that have shed some light on this phrase. If the person who used to "piece" in connection with eating then she might be influenced either by Scottish words as said in one post or by German words such as beißen (to bite) or Imbiß (a snack). I think the source of "Imbiß" is (only) ein Biß (a snack that is really not more than one bite). But etymological dictionaries may have something else. And it might well be that your mother formed a new verb from beißen or Imbiß and took the simiar-sounding English word piece that actually has a different meaning. - Such things can be observed with German-Americans who anglicize German words and use them. I think I have read a text of Mark Twain who illustrated such a German American speaker, who talks about a rattlesnake. But I can't remember what text it was. At least the text is very funny as most things of Mark Twain. Can an 'essay' be a fictional, creative piece of writing? Is the word *pingle* widely understood to mean something outside the dictionary definition?